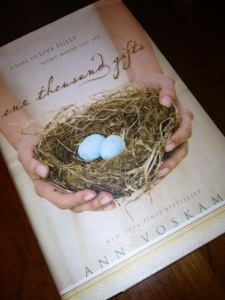 Intentional gratitude obviously predated Ann Voskamp and her powerful book, One Thousand Gifts (which by the way I highly recommend despite the fact that Voskamp is clearly not a disciple of Strunk and White and keeping it concise — somehow the book is nevertheless fabulous). Anyway, years before Voskamp’s book I heard someone somewhere say that it is a good discipline for children to keep lists of those things for which they are thankful. In the fall of 2007, I instituted this with my boys. I bought them notebooks and at bedtime I helped them write out three things from that day for which they were especially thankful. I had a semi-respectable run. Many nights from that fall have entries. Some nights they wrote some of the words, or the date themselves, but most of it was pure dictation. Then we moved and I dropped the ball. 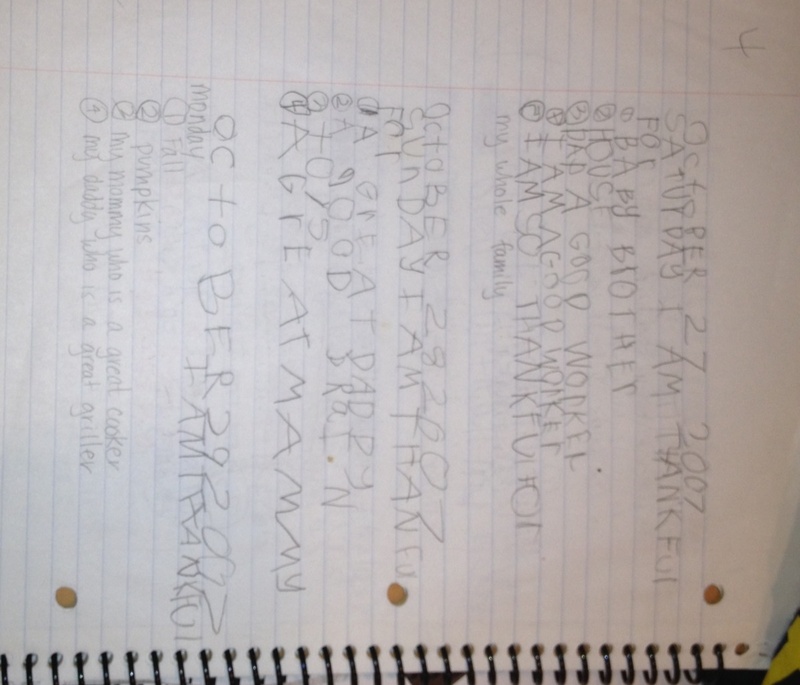 Amazingly however, little Will has intermittently picked up the ball and written in this journal. All. On. His. Own. I worry this could sound like I’m bragging, but believe me, I’m not. Because I know for a fact that I didn’t give him his sweet little heart, God did. I do think we are responsible, as parents, for shepherding and encouraging, but the idea that I could make him thankful is absurd. (Note: For the sake of fairness, Nate says he’s also written in his journal once in a while over the years, but we cannot find said journal. Shockingly enough). One entry is like the thankfulness prayer for boys everywhere: Will wrote that he was thankful for sports, for things that go, and for cars! In one he is praying that knee hockey will arrive. 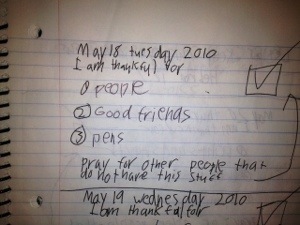 In many of his own entries, Will has a little box to check off when he prays “for people who do not have this stuff.” What a priceless little journal! Obviously tomorrow is Thanksgiving, the day Lincoln declared a national holiday, and its aim is gratitude. But may we not wait until the fourth Thursday in November to count our blessings. Instead, may we daily acknowledge the gifts that God has given us. I could do much better on this front. How about you? The Bible says, “Give thanks in ALL circumstances, for this is God’s will for you in Christ Jesus.” (1 Thessalonians 5:18 NIV emphasis mine). Giving thanks is doing God’s will. I hope your day tomorrow is fabulous and that we can spur one another on to grateful hearts every day of the year.